Matthew Mhlaleki speaks to SABC 2 programme TalkSA about how IkamvaYouth helped him improve his marks and get into university. When Matthew joined IkamvaYouth he had 45% for maths and 43% for physics and needed to jump at least three symbols to pursue his desire to study engineering in 2011. After two years with IkamvaYouth and countless hours of tutoring and midweek sessions, Matthew achieved Bs in both maths and physics in his final exams. In recognition of his achievements, he has also been awarded a bursary from Schneider-Electric to study Electrical Engineering at Wits this year. Watch the clip below for a brief insight into how Matthew and ikamvaYouth made it happen. PS. Schneider-Electric also donated kit-bags to our new 2011 IkamvaYouth cohorts in the expectation that there will be many more Matthew-type-stories in the years to come. Once again a big thank you to Schneider-Electric for their continued support. 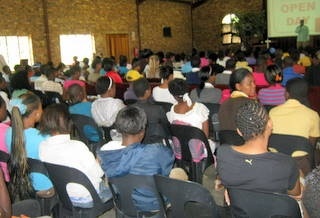 More than 350 learners accompanied by their parents, volunteers, NGO representatives and friends of IkamvaYouth from Ivory Park, Ebony Park, Rabie Ridge, Kaalfontein and surrounding areas filled the IkamvaYouth Centre hall to its capacity and listened attentively to increase their chances of being selected to become Ikamvanites in 2011. The sad reality is that of the 300+ learners who have expressed an interest in joining the Ivory Park branch we only have the capacity to admit 120 learners in 2011. Those who don’t make it are encouraged to join the Thandulwazi Academic Support programme hosted by the St Stithians Foundation on the St Stithians College school grounds. We will be happy to assist with additional information in this regard. Of course, if government and corporates have keen ears and interest to impact where it matters the most, this is an opportunity to invest financial resources to IkamvaYouth to increase its capacity to take more learners and be part of this life-changing opportunity. IkamvaYouth literally changes the lives and future prospects of our learners but also of the as-yet-unnamed learners to come who will benefit from successful ikamvanites returning to pass on their knowledge gained. IkamvaYouth Matrics above average all the way! More than a week has passed since Ikamvanites along with their fellow Grade 12’s received their matric results. Whilst Ikamvanites are busy with registration and sorting out their accommodation etc we have taken the time to make some stark comparisons with the results achieved by our Ikamvanites and those achieved by the schools that they attend. This is the first comparison of individual schools compared with IkamvaYouth’s results, and is for the Western Cape province. Firstly, this comparison helps to highlight that the IkamvaYouth pass rate in the Western Cape is 21% higher than the national average and 12% higher than the provincial average. These figures are even more impressive when one takes into account that the provincial average is based on all schools, including well-resourced schools demonstrating 100% pass rates. If we isolate the schools attended by Ikamvanites (under-resourced schools), the difference is revealed even more starkly. In every single case the IkamvaYouth pass rates far exceed the school pass rates. For instance, the majority of Makhaza learners attend Chris Hani Secondary School which performed poorly, with only 44% of matric students passing. However, all the Ikamvanites that attend Chris Hani passed. Such a disparity between school averages and IkamvaYouth’s results speak for themselves. In addition if we break down these results into Bachelor, Diploma, and Higher Certificate passes, IkamvaYouth triumphs again by exceeding both the national and provincial averages. Furthermore the same pattern is displayed when comparing to individual school results; IkamvaYouth’s 37% BA pass rate smashes Chris Hani’s 11%. So, when these learners are directly compared to the local schools, and compared directly within their context they are achieving overwhelmingly good grades. They are breaking the cycle they are escaping the trap that so many youth fall into because they fail to get that academic and social support that they need. Please have your say about these results and comparisons. Today ikamvanites attended a memorial service at UWC to celebrate the life of Nomzamo Kali, who was from the Makhaza Class of 2005. Nomzamo was a learner at Manyano High School when she became an ikamvanite, and she went on to achieve great things. 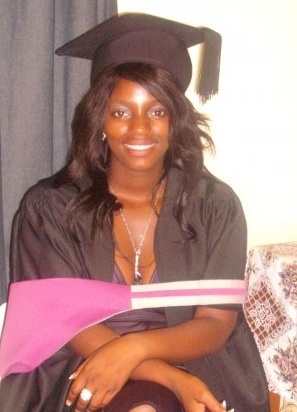 She enrolled in 2006 at UWC at the Faculty of Economic and Management Sciences, studying information systems. In 2010 she moved on to Honours, and was to become a Masters student in 2011. Thobela Bixa, an IkamvaYouth board member and classmate of Nomzamos at IkamvaYouth in 2005, gave a heartfelt speech. He urged those in attendance to continue to realise what Nomzamo stood for, and give back to their communities and assist disadvantaged youth to access tertiary education. University officials appealed to lecturers and students in attendance to continue to strive to produce and be students of Nomzamo’s calibre, and the president of the SRC mourned the nation’s loss of a role model. Nomzamo was not only a high achiever, but also did not wait to give back, and was doing it right from when she left school. Nomzamo was a talented, beautiful, smart and caring person who inspired many people. IkamvaYouth sends our deep condolences to Nomzamo’s family and friends. IkamvaYouth is looking for a budding social entrepreneur to be our National Coordinator, who will coordinate programme delivery and organisational management. The National Coordinator will report to the national committee (natcom) and the board of trustees. The National Coordinator concentrates on communications within the organisation and participates in all areas in order to compile and promote a shared understanding of the objectives, detailed plans, desired outcomes, tasks, roles & responsibilities, tasks & measurements of the day to day activities and monitors progress by assisting, guiding, coaching and taking remedial action in consultation with Natcom. The IkamvaYouth core operational expenses budget for 2011 is approximately R2,320,000 with additional discretionary programmes planned depending on levels of funding secured. The majority of the required funding has been secured for our short-term plans but we are currently trying to transition our relationships with funders to a multi-year funding model to enable the implementation of our scaling strategy. The National Coordinator will focus on maintaining and developing relationships with current and new donors for existing branches, enabling the Executive Director to secure funding and partners for establishing new branches. R240 000 Salary p/a + 13th cheque for full time position with flexibility, working from home or at our township-based centres. Based in either Cape Town or Johannesburg. Please submit your CV and a cover letter/email to zoe@ikamvayouth.org. This is a unique opportunity to play a pivotal role in a by-youth for-youth educational movement that enables disadvantaged youth to access higher education and job-based training. IkamvaYouth works with learners in the last 2-5 years of high school and provides supplementary tutoring, career guidance mentoring and computer literacy training. IkamvaYouth’s Media, Image and Expression programme provides an opportunity for learners to express themselves through art, performance, media and writing, while the HIV programme enables access to voluntary counselling and testing. The organisation has branches in the Western Cape (Khayelitsha, Nyanga and Masiphumelele), KZN (Chesterville) and Gauteng (Ivory Park).